Sunday, and the green beans in the vegetable drawer were on their third day of staring back at me in a very accusatory way. I had hoped for fava beans, but they are no longer anywhere close to in season. So I had these enormous green beans. Not skinny either. As thick as my ring finger. I needed to find a tasty recipe that was also relatively healthful. I tend to pack on three pounds a weekend when I’m cooking three meals a day for the family. The idea of having to run another mile in an effort to melt away the excesses of Friday through Sunday is anathema. So I turned to that stalwart companion, The French Farmhouse Cookbook, recommended by our fellow bon vivant, Aesthete. I found two. Breton Green Beans and Green Beans with Onions sounded good. I had the ingredients for both. The problem was that I also had some more leftovers to deal with. I’m a frugal cook. Never more so than in years when the price of groceries soars and I’m forced to confront a budget. I’d been gnawing away at a side of smoked salmon for almost a week, and I was worried that I wouldn’t make it alone through the fish before I was forced to abandon it to the garbage can raiding squirrel who lives in the backyard. Fresh green beans. 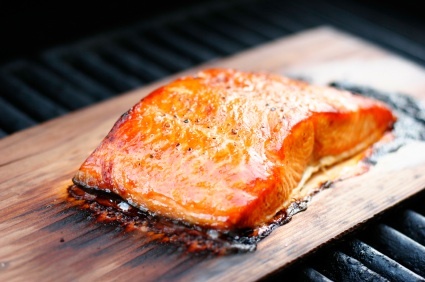 Smoked Salmon. Well, why not? I combined both recipes and ad-libbed a bit. It came out fine! I only wish that I had had alfalfa sprouts, too. Then I could have entitled this post “Luncheon from Alfalfa to Omega-3’s….” But the mix, and the pun, may have been a bit dubious. The Easy and Elegant Life’s Smoked Salmon and Green Beans Luncheon for Two. 15-20 of the huge fresh green beans. 1 clove of garlic, spilt in two with the green germ removed. smoked salmon (I used about a cup and a half) flaked. Boil a pot of salted water. Wash the green beans and destring them if needed. Using your Cutco kitchen shears, clip the ends of the green beans and cut them on the diagonal into 1 inch pieces. Boil them for about 4 minutes. Drain. Mince the parsley and garlic together. Melt the butter in a skillet, letting it go until it stops foaming. Sauté the onion in the butter until it is soft (about three minutes?) Add the garlic/parsley and sauté for an additional minute or two. DO NOT brown the garlic. When you start to smell it, mix in the drained green beans. Sauté for another couple of minutes, enough to get the mix coating the green beans. Salt and pepper to taste. Flake in the salmon and serve with lemon slices to squeeze over the dish. We drank an inexpensive Sauvignon Blanc (Canyon Road, California, 2007) with the meal. It brought out all the bright flavours of the beans and mellowed the salmon. This entry was posted in Living and tagged beans, luncheon, recipes, smoked salmon. Bookmark the permalink. ELW, it was destined for pasta, but the thought of those extra miles got in the way… Come to think of it, I believe I deglazed the pan with a little wine. Isn’t that funny? I gain weight on the weekend too, then try desperately hard to catch up during the weekend. I’ve taken to weighing myself only on Friday mornings–never Monday! This weekend was worst than most because I spent it baking: cookies and cupcakes to send as care packages to my boys. Of course my husband and I had to test them out, first. Always something pleasant here to appeal to my senses and always food for thought.